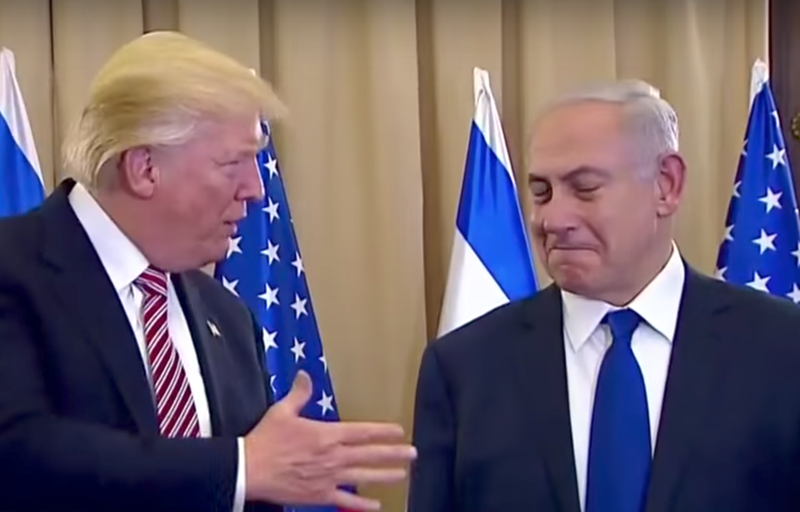 Yesterday, while standing next to Benjamin Netanyahu, Donald Trump said, "I never mentioned the Word or Name 'Israel' - never mentioned it, during that conversation - they were all saying I did - so ya had another story wrong. Never mentioned the word 'Israel'..."
President Trump was, of course, referring to his recent meeting with Sergey Lavrov and Sergey Kislyak in the Oval Office. It's alleged that Trump disclosed classified information to the Russian Foreign Minister and Ambassador - and in so doing also, directly or indirectly, also revealed the source(s) of the classified information. Notice as President Trump said, "... during that conversation ...", President Netanyahu was turning toward Trump while jutting his jaw forward. A "Jaw Jut" virtually always indicates a surge in adrenaline. When it comes to his conduct on camera, President Netanyahu is probably the most experienced and skilled high-profile head-of-state in the World. Yet we still see this body language red flag. It begs the question: Why was Netanyahu experiencing an adrenaline surge? The Israeli leader was also simultaneously displaying an "Inward Lip Roll". An inward lip roll (ILR) is a sign that the subconscious/edge-of-consciousness trying to suppress strong feelings (both from being expressed outwardly - but also internally). What emotion was Netanyahu suppressing? During this same nonverbal cluster, Netanyahu was also blinking with prolonged duration. This is a psychological blocking behavior - indicating he strongly disapproves of what he is thinking, seeing, and/or hearing. Summary: President Benjamin Netanyahu's nonverbal behavior during President Trump's statement indicates he had strong opposition to the US leader making such an open declaration.